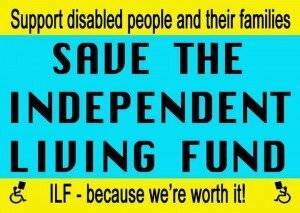 Please help us save the independent living fund! You can use this picture as your twitter or Facebook logo to show your support. “I got up this morning, brushed my teeth, showered, ate breakfast, got dressed, checked my e mails, went to work, had lunch with colleagues, met with friends on the way home from work, popped in on my mum to see she was alright before coming home to do a couple of hours work on my open university degree before bed. I was able to do all this because of the money from the Independent Living Fund that helps pay my Personal Assistant to support me to do the things I can’t manage to do directly because I have a condition that means my hands do not work and I get around using a wheelchair” – ILF recipient. The money from the independent living fund helps pay for a personal assistant, and enables disabled people who need support to have a quality of life to do the same things everyone else can do. Live. 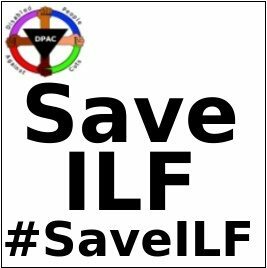 The government says “ILF recipients will be reassessed by their local authority, and will be funded by the local authority” The money given to the local authority to meet a disabled person’s support needs will not be ring fenced. The local authority can spend that money meant for disabled people and their support needs on other resources. Disabled people who need the support fear less or no support at all and then being placed into residential care, far from friends and family. Imagine this; your local authority has cut your support needs. You would have to rely on the local pop in service from carers you do not know, to keep you clean, warm up a meal in the microwave, and convenient at the time for the carer but not a convenient time for you. If you need night care, you would then be forced to wear incontinence pads or even worse cathertised. You would then be only able to shower once a week, have no social life, have to perhaps use a hoist and then excluded from every day activities outside, forced to give up your pet if you had one, no garden, forced into isolation, having to sack the personal assistant you relied on for many years with no redundancy for them. Now you are thinking you do not want to go on anymore. Its how do I go on like this with little support? Due to the lack of support you are now isolated at home cut off from society and from friends and family and as the lack of support means no independence, no social life, can’t work, no quality of life, it would make anyone feel down, and even depressed. It’s awful to contemplate isn’t it? s. Rights to live independently in the community, to have our support needs met, so we can have a quality of life, and do the same things as everyone else does. Live. Society forgets that we are human beings, people, we are mothers, fathers, brothers, sisters, friends, neighbours, colleagues, but society sees the impairment, not the person we happen to be. We are judged, discriminated against, and called a drain to society. Well, we are not! People can be born with an impairment, or at some point in their lives can even be struck down with a devastating illness, hit by a car, lose your mobility need to use a wheelchair to get around, have a breakdown, could lose your job and need to claim benefits to live. The social security system was put in place to protect those who needed the support, who may be too ill to work. You need the support every day to carry out the simplest of tasks. Life is unexpected, it’s cruel and its tough, it can change in a flicker of an eye lash, and it can happen to YOU. Life is really hard living as a disabled person every day. Trying to manage life with all the same worries as non disabled people. Money, keeping a job, family life, health issues, how to get around using public transport. It’s bloody tough. “The independent living fund gave people with severe impairments the support needed to live life as we chose, so we could work, go shopping, feel part of society, a human being. A non disabled person is not used to thinking about how they would go to the toilet, get in and out of their home, get to work but we need to plan all those things in advance and ensure we have the support to do them.” -ILF recipient. Our demand is to keep the independent living fund open, open it up to new claimants and open up independent living to all disabled people so we can keep our independence, and with support, have a quality of life and live. All I ask of you is for your help. Help us save the independent living fund from closing on 30th June 2015. As disabled people, we want rights to live independently as possible, having a quality of life despite what we battle with every day with our disabilities and illnesses. Why? Because we’re worth it! We are human beings and we want to be treated as such, not the stock the government and great swathes of society think we are. We are worth it! 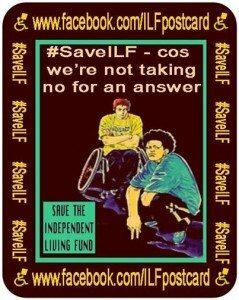 Help us keep the independent living fund open and help us in the fight for our rights so we can have a quality of life living in society as best as we can. 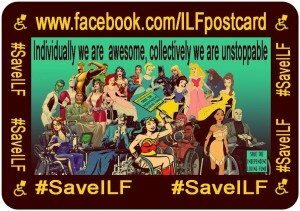 The “Save The Independent Living Fund” postcard campaign is supported by GMCDP, ALLFIE, DPAC, Inclusion London and Equal Lives.